Nothing Says Spring/Summer 2018 Fashion Like Polka Dots! 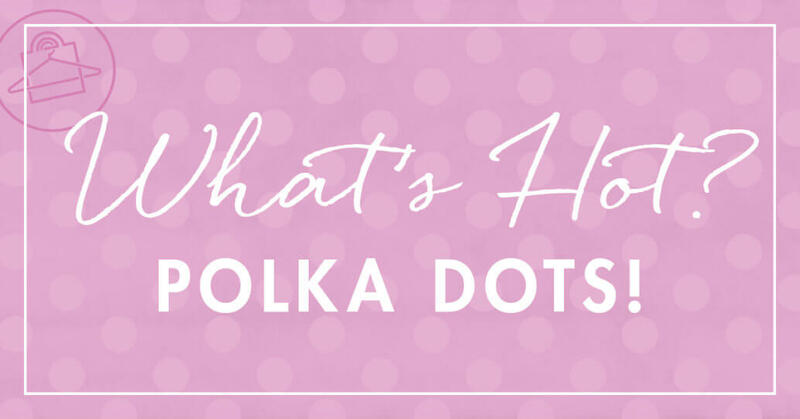 As these early weeks of Spring pass by, I’m seeing a new trend emerge that I want to share with you – a trend that comes and goes every few years, but always remains classic: polka dots! Polka dots are so fun and whimsical but they’re not always the easiest pattern for women to pull off. Today, you’ll discover some fun ways on how to wear polka dots with style this spring and summer season! When thinking about how to style polka dots, one fun way is to mix the scale and proportion of the polka dot patterns. Doing so creates a graphic look that will grab attention! Love these pieces? Click the tags to Shop the Look! In the look above, you’ll see how well this style is applied with a lovely large-scale polka dot blouse coupled with a dainty neck scarf that has a much smaller pattern. Create an even more sleek, striking look by pairing it with a deep magenta double-breasted trench coat (perfect for springtime), a super cute pair of cropped cigarette pants, and a classic pair of leather pumps. Another way you can wear polka dots is by styling it with stripes! It’s not uncommon to see this combo in all-in-one garments (like a top having dots and stripes on different panels). Sometimes it looks great, but other times it can appear too “busy” depending on the pattern mix. However, I recommend this classic pairing with a new twist! I love mixing different elements of polka dots and stripes through clothes and accessories…meaning you can wear an outfit that is either striped OR polka-dotted and accent that look with an accessory in the opposite element. In this look, you can pair this gorgeous subtly striped off-the-shoulder romper with a Panama-style polka dot hat, stylish gradient polka dot sunnies, top handle handbags that have either a mix of stripes & polka dots or polka dots through and through, and an open-toed sandal with a polka dot knotted bow. I’m in 😍 with this look for summertime! Polka dots on ladies is so feminine and classic! What better way to rock them than by showing a bit of skin! Revealing your neck and shoulders can be both alluring and spirited. This season you have lots of options for polka dot tops that are more than meets the eye. In this collection, you’ll see these types of polka dot tops trending: blouses with keyholes (slits just below the neckline in the front or back), off-the-shoulder tops, one-shoulder or cold-shoulder tops, as well as tops with sweetheart or plunging necklines. Style these tops with fitted jeans or pants for a fun, casual look; or opt for a flowy, wide-leg pant for a more dressed up look. Weave polka dots into your wardrobe in creative ways such as a cover-up – but not in the way you think! A fun way to style polka dots is by wearing them as a pareo over your shorts! So there you have it! You have four new ways you can style polka dot clothing and accessories. Pretty sweet, huh? Do you have another way that you like to wear polka dots? Be sure to comment below!